The Derby City Classic One-Pocket division is the premier event in the discipline. In the event's 20-year history, titlists have included Efren Reyes � more than a few times � Shannan Daulton and Scott Frost. Tony Chohan has long been among America's best one-holers � and the big man from Michigan brought his best to the 2018 event. The event can be unforgiving, with players battling in race-to-three matches in the modified double-elimination format, allowing players to buy back into the field after one loss. Chohan fought his way to the final four in an event that began with 393 players. There, he faced Francisco Bustamante, who went on to win this year's Master of the Table, based on his performance in one-pocket, banks and 9-ball events. For this month's entry in "Stroke of Genius," Chohan came to the table in a tough spot in the first game. Down 3-1 in balls to the Filipino legend, T-Rex had seven balls hovering near the head rail, with the cue ball an inch from the 10 ball. He was shooting at the bottom right pocket, while Bustamante had the bottom left. With a firm stroke and a touch of left English, Chohan clipped the left edge of the 6 ball. 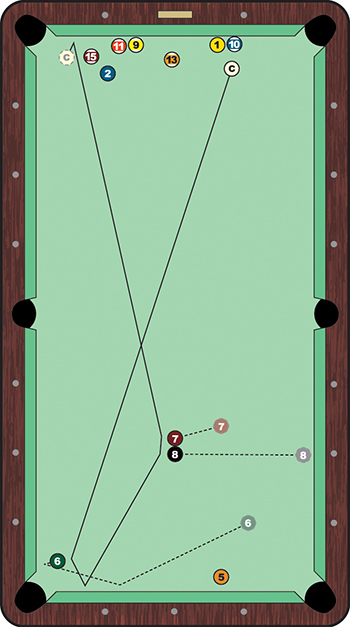 The spin helped open the cue ball's angle after contact with the foot rail, where it headed straight for the 7 and 8 balls. It clipped both, sending them toward Chohan's side of the table. The cue ball then rolled up-table and came to a stop nearly buried in the top left corner. In the end, Chohan improved his position with three balls now able to be pocketed, while leaving little for Bustamante (though Bustamante would end up taking the match, 3-2).